Your lifelong oral health and comfort depend upon continual preventive and restorative dental care. Tooth enamel is the hardest substance in the human body, but it’s exposed to over 600 different forms of bacteria throughout a person’s life, in addition to extreme temperatures and crushing pressure. Comprehensive checkups and thorough cleanings will reduce your risk for serious dental problems, but at some point, you may need professional dental restorations. Dr. Canzoneri will approach your case with special attention paid to optimizing your oral health, cosmetic appeal, and comfort during procedures. Natural teeth are a gift, and we want yours to serve you well for years to come. To ensure the longevity of your dental work, we will always start by addressing underlying issues like gum disease. 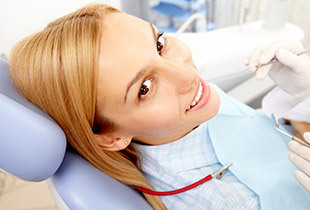 At your first visit, Dr. Canzoneri will thoroughly examine your teeth, gums, and bite. If he finds that you have tooth decay, gum disease, TMJ disorder, or other problems, he will offer modern solutions. He has experience in complex restorative dentistry as well. Our advanced technology includes the state-of-the-art Waterlase dental laser for periodontal therapy and T-Scan for full-bite analysis.